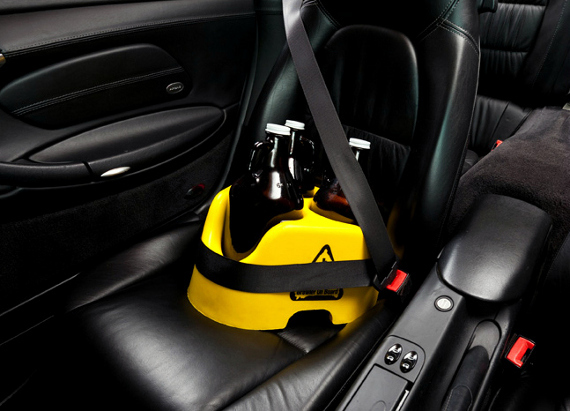 Growler On Board is a car seat meant to protect your most precious cargo. Nooooo, not your baby. Pshhh! Silly. I’m talking about your beer. Where would you be without it? Thinner, richer, more successful and with less regret? Yeah. Same here. Damn you alcohol! No, wait — I don’t mean that! I’m sorry boozy, I take it back. Where was I? Oh yes, drinking problem. The Growler On Board makes safely transporting 3 jugs of the good stuff as easy as buckling a seat belt. Thank goodness. I don’t know what I would do if something were to happen to my little brewskies. *sniff* I don’t even want to think about it!